Over the years, Oracle Database has gained a reputation for being expensive and difficult to use. Today, however, you can download a free IDE called SQL Developer that makes it easy to enter, edit, and run SQL and PL/SQL statements. And this book makes it easier than ever to master the SQL and PL/SQL skills for working with an Oracle database. This book is worth its cost just for its detailed and complete description of the SQL SELECT statement. The book takes 4 chapters (129 pages) to cover all aspects of it. I have not found any other book, including Oracle’s own documentation, which more completely describes how to use the SELECT statement." In this section, you’ll learn the concepts and terms you need for working with any database. You’ll also learn how to use Oracle Database and Oracle SQL Developer to run SQL statements on your own computer. In this section, you’ll learn all the SQL skills for retrieving data from a database and for adding, updating, and deleting that data. These skills move from the simple to the complex so you won’t have any trouble if you’re new to SQL. But these skills are also sure to raise your expertise even if you already have SQL experience. Here, you’ll learn how to design a database and how to implement that design by using the DDL (Data Definition Language) statements that are a part of SQL. When you’re done, you’ll be able to design and implement your own database. You’ll also gain valuable perspective that will make you a better SQL programmer, even if you never have to design a database. In this section, you’ll learn how to use Oracle’s procedure language, PL/SQL, to create stored procedures, functions, and triggers. You’ll also learn how to manage transactions and locking. That will give you a powerful set of PL/SQL skills. Here, you’ll learn how to work with the timestamp, interval, and large object data types. These data types became available with releases 9i and 8, and they provide features that are critical for storing data in today’s global and digital world. Unlike most Oracle books, this one starts by showing you how to query an existing database rather than how to create a new database. Why? Because that’s what you’re most likely to need to do first on the job. Once you master those skills, you can learn how to design and implement a database in section 3. Or, you can learn how to work with other database features like transactions or stored procedures in section 4 or advanced data types in section 5. Unlike many Oracle books, this one shows how to use Oracle SQL Developer to enter and run your SQL statements. SQL Developer is a graphical tool that’s an intuitive and user-friendly replacement for SQL*Plus, an arcane command prompt tool that has been around since the early days of Oracle. As a result, using SQL Developer instead of SQL*Plus will help you learn more quickly. Like all our books, this one includes hundreds of examples that range from the simple to the complex. That way, you can quickly get the idea of how a feature works from the simple examples, but you’ll also see how the feature is used in the real world from the complex examples. That’s why developers often code SQL statements that don’t perform as efficiently as they ought to. That’s why they aren’t able to code some of the queries that they need for their applications. And that’s why they don’t take advantage of all the power that Oracle Database has to offer. That’s also why our Oracle SQL book should be required reading for every application programmer who uses Oracle Database. It shows you how to code the SQL and PL/SQL statements that you need for your applications. It shows you how to code these statements so they run efficiently. And it introduces you to many of the most useful advanced features that Oracle has to offer. This book is also a good choice for anyone who wants to learn standard SQL. Since SQL is a standard language for accessing database data, most of the SQL code in this book will work with any database management system. As a result, once you use this book to learn how to use SQL to work with an Oracle database, you can transfer most of what you have learned to another DBMS such as MySQL, DB2, or Microsoft SQL Server. Maybe more important, though, we now include the solutions to the exercises as a download from our website. That’s because the only customer complaints we received for this book were that we didn’t provide the solutions to the exercises. Both of these products can be downloaded for free from Oracle’s website. And appendix A of this book provides complete instructions for installing them. If you want to use another edition of Oracle Database, like the Personal Edition of 12c, you can still use the techniques described in this book. However, you may need to install that edition, and you may need to use a different procedure to connect SQL Developer to it. That’s why appendix B shows you how to do both. Unfortunately, you can’t use SQL Developer to connect to versions of Oracle Database that are prior to version 9.2.0.1. So if your company is using an earlier version, one alternative is to use SQL*Plus to work with it as described in chapter 2. A better training alternative, though, is to download and install the Express Edition of Oracle Database and SQL Developer as described in appendix A. Then, when you’re through training, you can use SQL*Plus or a commercial product like Toad to work with the version of Oracle Database that your company uses. "If you use Oracle as a backend database to your VB, C#, or ASP.NET database applications, then Murach’s Oracle SQL and PL/SQL should be the next addition to your developer library." "This book is worth its cost just for its detailed and complete description of the SQL SELECT statement. The book takes 4 chapters (129 pages) to cover all aspects of it. I have not found any other book, including Oracle’s own documentation, which more completely describes how to use the SELECT statement." "A lifesaver! Got stuck on one of my Oracle 9i assignments and it took just one look in this book and I was all set and ready to take on other assignments. It is really a reliable reference book." "Although I am primarily a SQL Server programmer, this book explained many of the ‘Oracle’ ways to do the stuff I already do with SQL Server in a manner that I could understand and relate to. I found lots of examples of stuff that I was struggling with in entering into my first large, full-scale Oracle programming projects. It is open daily when I work on Oracle code now." "Murach books have a reputation for accessibility to the novice user. 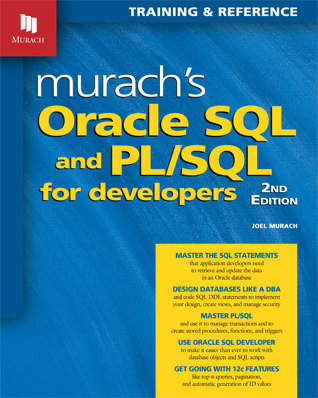 Murach’s Oracle SQL and PL/SQL is just as accessible to the novice, but also contains plenty to assist other Oracle users.... The result is a book that is great for Oracle novices, but also great for casual intermediate users like myself." "I bought this book to take my SQL skills up a notch or more. This book really does that. It moves from the basics to advanced queries. The advanced queries are very well explained and you get useful skills and understand how to extend this to other queries." Oracle SQL Developer is a free, graphical tool that makes it so much easier to work with Oracle databases that we think you should use it right from the start. So this chapter shows you how to use SQL Developer to work with database objects and to build and run SQL statements. Once you have SQL Developer installed on your system, chapter 3 shows how to use SQL SELECT statements to retrieve data from a single table. Our hope is that this will give you a better idea of how well our book works and how much there is to learn about SQL. There are no book corrections that we know of at this time. But if you find any, please email us so we can post any corrections that affect the technical accuracy of the book right here. Thank you!